The radar system uses a bumper mounted radar unit in conjunction with a Video Radar Decision Unit (VRDU in current, VRDU2 in new Cascadia) in order to monitor objects ahead of the vehicle and commands the ABS, transmission and other engine functions in the truck in case of need. In the original Freightliner Cascadia®, Active Brake Assist 2.0 (ABA 2.0) is always on, detecting distances to objects, calculating speed and determining whether warnings or actions are necessary. Based on the position and speed of the truck in relation to other vehicles, ABA 2.0 warns the driver and can engage in full or partial braking to mitigate potential collisions that might otherwise be unavoidable. In addition to these ABA 2.0 features, the new Freightliner Cascadia includes ABA 4.0, with radar tracking of stationary objects and the capacity to engage full braking to mitigate the severity of the collision. As part of ABA 4.0, Moving Pedestrian Warning detects moving pedestrians within the truck’s path, and, as long as they stay in motion, can act to help mitigate a collision at vehicle speeds below 25 MPH, using partial braking. Never a substitute for cautious driving, Moving Pedestrian Warning is not functional at highway speeds and may not detect every pedestrian in every possible situation. When a moving pedestrian enters the truck’s path, Active Brake Assist 5.0 applies input from the radar and camera sensors to warn the driver with visual and audible alerts and applies partial braking. If the driver doesn’t take action, full emergency braking brings the truck to a complete stop, provided the pedestrian is moving. On the original Freightliner Cascadia®, Adaptive Cruise Control (ACC) automatically adjusts cruising speed to maintain a safe, continuous following distance of 3.5 seconds from vehicles in its lane ahead. With the optional headway switch, following distance can be adjusted between 3.5 and 2.3 seconds. ACC decelerates the truck to its preset distance using torque reduction, engine braking and service braking, maintaining a reduced cruising speed and reaccelerating to the set cruising speed when the slower vehicle clears or accelerates. 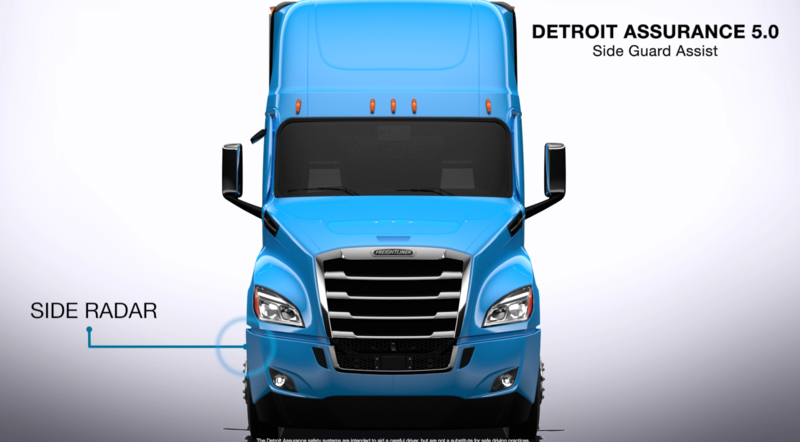 With Detroit Assurance 4.0 on the new Freightliner Cascadia, the optional headway control is now part of the new interactive dash display, enabling following-distance adjustments between 3.6 and 2.4 seconds. Tailgate warning, independent of ABA and ACC features, will activate according to a truck’s speed and following distance. A visual dash alert will trigger, after 10 continuous seconds of traveling at a speed greater than 45 MPH, following within 2.7 or fewer seconds; at speeds between 25 and 35 MPH, following within 1.8 seconds or less; and at speeds between 35 and 45 MPH, following at a ramp-up distance between 1.8 and 2.7 seconds. Once activated, Tailgate Warning will deactivate only at speeds of less than 20 miles per hour and re-activate at speeds greater than 25 miles per hour. By remaining in any Tailgate Warning mode for 10 seconds or longer, the event will become reportable via J1939 to the selected telematics system. In stop-and-go traffic, if the vehicle in front stops, your truck will also come to a stop and hold indefinitely. If the vehicle ahead moves in under two seconds, the truck will resume moving at a safe following distance. ACC braking on stationary objects is now available at speeds of 35 mph or lower when the ACC system is on. If a stationary object, such as a disabled vehicle, is detected, the truck will smoothly reduce its speed to 0 mph.